Free Document Shredding and Destruction Software! Permanently shred documents and remove deleted files from your system! Use Advanced US Dod 5220.22-M erasure method. Easy-to-use and user-friendly program apply to everyday use. Support perpetual data, file and document shredding and prevent leakage of sensitive information. Drop Target Window – easy operation to add files by drag & drop feature. Delete unwanted files, folders and free space securely and rapidly. Compatible with Windows 7/windows 8. File Shredder is an advanced data security tool for Windows which allows you to completely remove unwanted files and sensitive data from your hard drive by overwriting it several times with US Dod 5220.22-M erasure method. With File Shredder you can securely delete files and documents from your hard drive without fearing that they could be recovered sometime. There are quite a few software tools today for retrieval of deleted files under Windows OS. Those tools, often referred to as "file recovery" software, are taking advantage of shortcoming of Windows "delete" command that we all use regularly to delete files. Actually, the "delete" operation in Windows only removes bits of information from files so they appear have been deleted in the OS. It is easy to retrieve those files using aforementioned specialized file recovery software. In order to remove, or shred files permanently from your system you have to use a program that is capable of rewriting the files with random series of binary data multiple times, and this process is often called shredding. That way, the actual content of the file has been overwritten and the possibilities to recover such a shredded file are mostly theoretically feasible. File Shredder has been developed as a fast, safe and reliable tool to shred company documents. The author of this program released it for free under GNU license and you are welcome to download File Shredder and use it without any restrictions. 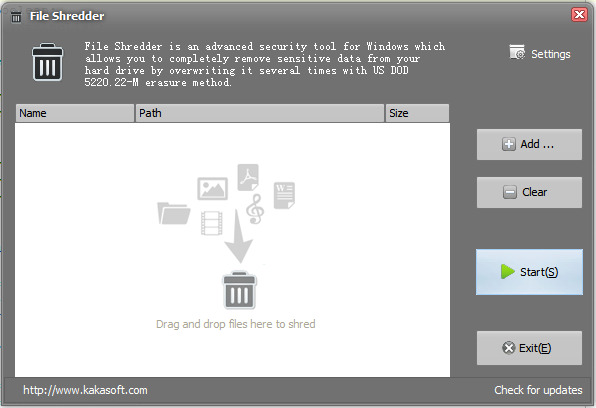 File Shredder is simple but powerful program that surpass common commercial file shredders out there. The Author believes that such a utility should be available for everyone without any charge and this permanent and safe removal of confidential documents is a matter of basic rights of privacy. Securely wiping files: Configure File Shredder to overwrite a file data with random information up to 15 times, so it is practically impossible to recover the original data. Multi-Language Supported: File Shredder supports MLS technology which allows you choose display language from the language list inside the program. Languages are changed on-the-fly without additional plug-ins as installation prepares everything ready. Integration with Windows Explorer: Wipe your files or folders right from Windows Explorer. Just select the files or folders you want to delete, and then navigate to Right-Click Menu and select "Destroy with Shredder" option. Virtual Folder Shell Extension: Set File Shredder to have its icon on your desktop. Therefore it will act similarly to Windows Recycle Bin, i.e. you can drag & drop items right to the icon. Drop Target Window: Make file shredding easy and quick by using drag & drop feature. Full Compatibility: fully compatible with Windows7/Windows8/Vista/2003/XP/2000. "File Shredder is a great utility. Works as advertised - how often do you see that!" "It works! I'm back in business. Great application, great support! Thanks! " "When you delete a file from your computer, only the file reference is deleted. The data is still retrievable...Drag a file to File Shredder and watch it disappear forever."